In order to fit an additional 8 million pixels into what an HD stream already requires, High Efficiency Coding is required. High efficiency coding essentially optimizes the way 4K video can be streamed with the least amount of bandwidth connection needed to reach households. Consequently, the current encoding standard of H.264, which is compatible with most connected playback devices from mobile phones, tablets, laptops to computers, and HDTV’s has been replaced on all 4K TV sets with H.265. Simply stated, 4K shows MUST be encoded in H.265 to be watched on 4K TV sets. Since most other playback devices do not have the decoder needed for H.265, these shows can only be seen on 4K TV sets. Despite the fact that H.265 is twice as efficient as H.264, it still demands a minimum bandwidth of approximately 15.1 Mbps. Putting this in perspective, the average US household only has 7.0 Mbps. To ensure compatibility with H.265 streams, the SwigStream 4K TV Stick is the first such device to decode both H.264 and H.265 encoded videos. However, it is also the first and only device to introduce SWIG MEDIA’s patent pending H.264 High Efficiency encoding offering the dual advantage of: 1) streaming 4K shows at less than half the bandwidth required for H.265 encoding; plus 2) it can also be watched on just about every other playback device from mobile phones to HDTV sets as they already decode the H.264 standard. Enjoy the widest selection of Global Entertainment in unmatched resolution, clarity and user-experience. SwigStream™ 4K TV is the only OTT set-top device of any size to stream 4K shows and films within the bandwidth limitation of the average household and which can simultaneously be seen on most other devices (e.g. mobile phones, iPads, Tablets, Computers and TVs) which are not yet 4K. Additionally, having a built-in H.265 decoder, SwigStream™ 4K TV can enable your watching films streamed in H.265 on any device you can connect to that does not have an H.265 decoder (e.g. HD TV’s and most other popular playback devices). 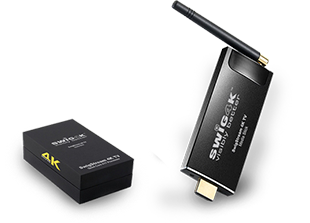 Following an easy 3 step activation process, SwigStream 4K media stick becomes your Gateway To Global Entertainment. Our simple, intuitive, menu selection guide, with personalization options, turns your TV set into a complete home entertainment center. Watch your favorite shows or listen to any online service or your home music collection from any device with USB, MiraCast, AirPlay or external storage device. Enjoy amazing game station excitement, video chat or create and share entertainment recommendations with your own Swig Media Friends Network, all on a small and easily portable SwigStream Media Stick. SwigStream content delivery insures the very best video quality and end-user experience plus unprecedented savings in bandwidth consumption. Additionally, it significantly improves video quality and user experience in poor bandwidth locations, where content from other sources could either not play, or pause endlessly. A rapidly-expanding selection of 4K Programs, 3D films, ‘Free to Watch’ and Premium Channels, Films On-Demand and Pay-Per-View selections are offered from our own Swig Media Global Cloud Servers, in our proprietary and patent pending SwigStream™ format. Selection options include: entertainment and music channels, special interest and short format channels. Adult Entertainment is also included with stringent Parental Access Controls. Video delivery in a universal video format that allows you to watch your shows on the SwigStream™ Media Stick and any other mobile or connected device you have - irrespective of manufacturer or operating system, e.g. Apple, PC, Android) - without the need to have your SwigStream Media Stick with you. Video delivery in rapid, successive, few second video ‘swigs’ (e.g. video chunks’), rather than progressive download (used by competitors). 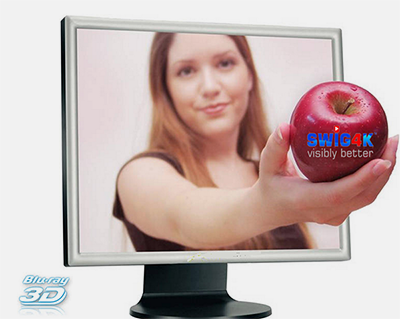 Hailed as the most advanced streaming technology, Swig-Streaming eliminates annoying buffering and helps to insure the very best user experience possible on any given device. Real-time accommodations for bandwidth fluctuations. SIGNIFICANT bandwidth conservation on every device.